Disclaimer: This blog post focuses on North Carolina law and follows the NC Secretary of State rules. We cannot speak nor advise you on what other states’ rules and policies are for limited liability companies. *This information is taken from the North Carolina Secretary of State’s website and can be viewed here. Now that you have decided on a name for your NC Limited Liability Company (and, if you haven’t please check out Part 1 of this blog series), you need to file the appropriate paperwork with the NC Secretary of State to become legal. *If you are a foreign limited liability company that wants to conduct business in NC, then you need to submit a Certificate of Authority form. Remember: “foreign” does NOT mean a different county. “Foreign” refers to companies that are registered in a different state (when the “home state” of the LLC is not in NC). *Now back to NC domestic companies. . . . . 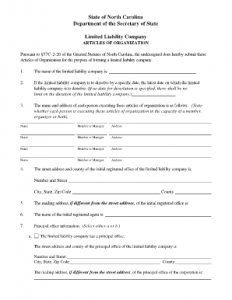 If you want to form a limited liability company in NC, then you need to submit a form called Articles of Organization to the NC Secretary of State. So, what exactly is in the Articles of Organization? Organizers/Members-the organizer/member must submit the Articles with their name, title, and their business address. Principal Office address-if the LLC has one, then it must be included in the Articles. Registered Agent-the purpose of a registered agent is to forward to the business entity at its last known address any notice, process, or demand that is served on the company. A foreign business corporation or limited liability company authorized to transact business in this state and whose business address is identical to the registered office. Where do I file my Articles of Organization? With the NC Secretary of State’s office. Amazing! Its in fact remarkable post, I have got much clear idea on the topic of from this article.